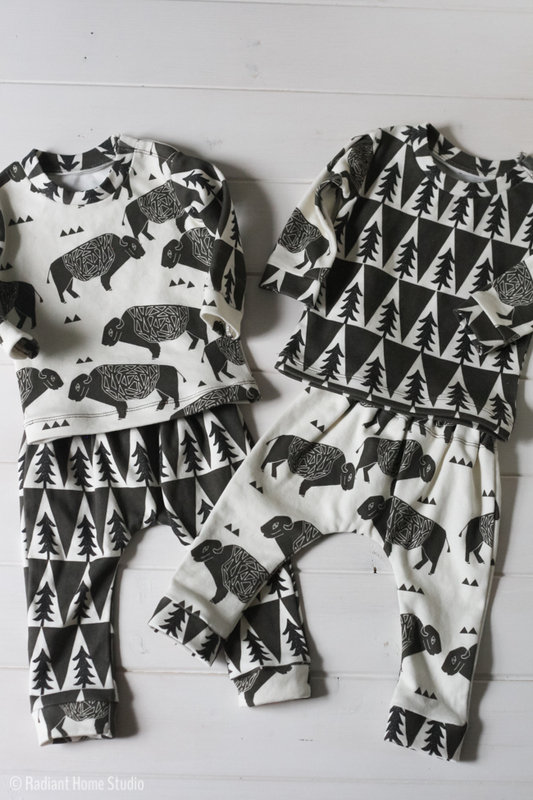 Is there anything cuter than tiny baby clothes? One of my friends just had twin boys, so I took the opportunity to make some comfy, manly baby clothes. I usually make Divided Baskets for my friends’ baby showers, but this friend needed clothes more than organizational storage bins. 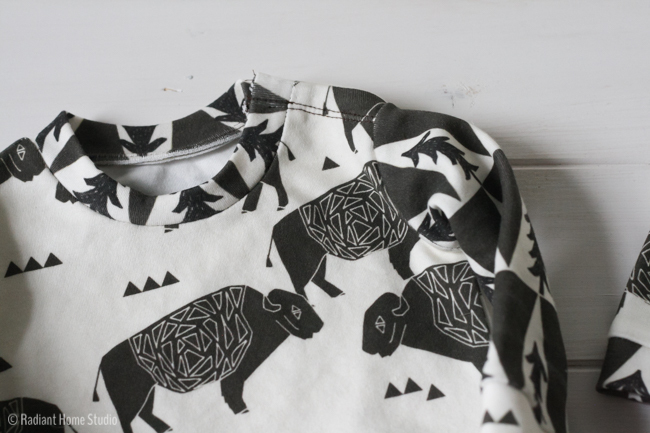 I knew I wanted to use the organic cotton knit from Spoonflower for these baby clothes. 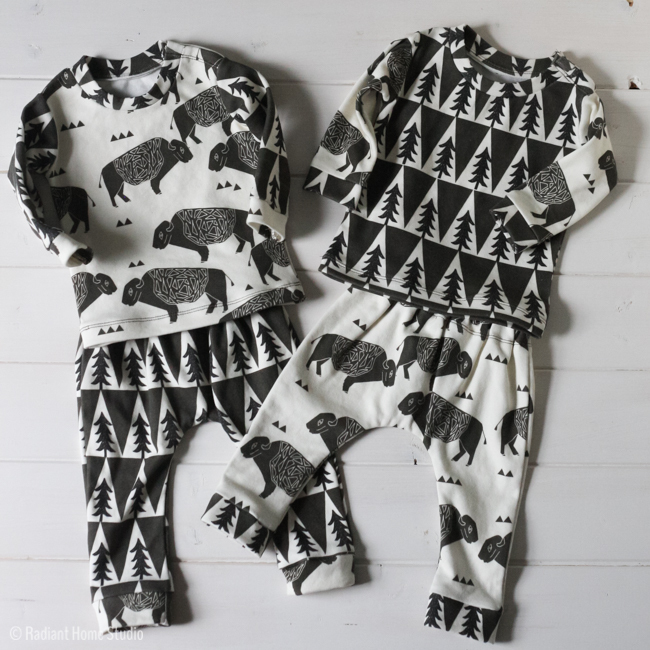 It seemed like the perfect choice for a natural-minded mama and her new babies. I also wanted a clean, modern design for the fabric. 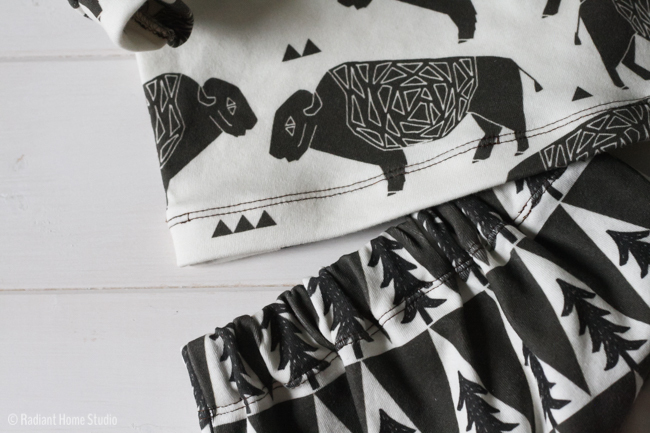 I love Andrea Lauren’s block-printed animal designs, so I chose the buffalo print and a coordinating tree design from her shop. For the pants, I used Rae’s Just Hatched Baby Leggings. It is free and easy to sew! There are only 2 pages to print and 2 pattern pieces to cut. Directions are sketched out in the blog post, but experienced sewists should have no problem putting these together with just a quick glance at the instructions. I couldn’t find a free shirt pattern that I liked, so I just traced a newborn sized shirt from Old Navy to get the right body and sleeve size. I had planned to make a pull-over shirt, but my buffalo fabric was less stretchy than the one I traced. I ended up finishing the shoulder seams on one side of the shirt and adding snaps, so that it would be sure to fit over the babies’ heads. That made the sewing a little bit more complicated, but the shirts were still pretty quick to put together. I used a twin needle for most of the sewing, and serged a few of the edges that didn’t have a clean finish. The twin needle also makes a nice topstitch that mimics a cover stitch like you see on store-bought clothes. If you are interested in how to use a twin needle to get a nice hemmed edge on stretch fabric, you can read my twin needle posts here and here. This is the first project I’ve made with Spoonflower’s organic cotton knit. It’s a nice weight of fabric for baby clothes and is soft to touch. It is stretchy enough for t-shirts, but still stable. I washed it before sewing, and there was very little fading. It seems to hold color well. I believe there was some shrinkage, though I didn’t actually measure. I used some Art Gallery knit recently. Just for comparison, the Spoonflower knit is slightly thicker and slightly less stretchy than the Art Gallery knit. I’ll definitely use it again though if I’m looking for a specialty fabric design. Love those prints and the matching set! <3 Great job! These are so cute!! Love the tips on Spoonflower knit. I’m wanting to try some at some point, so thanks for comparing! Thanks Dana! I can’t believe I haven’t tried it yet, but it’s really best for novelty fabrics because of the cost.